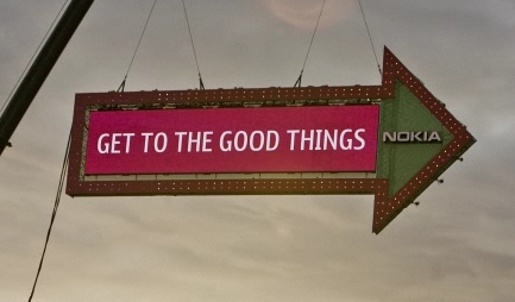 Nokia recently launched the World’s Biggest Signpost above Potters Field, in the centre of London, showing off the “Good Things” feature on their Ovi Maps navigation system, inbuilt on the Nokia N97 mini. Nokia phone users were invited to enter their favourite spots on the dedicated site, interacting with a giant arrow suspended from a crane next to London’s Tower Bridge. From October 23 to November 6 the 8 metres tall, six ton motorized arrow displayed the name and direction of favourite locations. Nokia’s team behind the scenes analysed text messages from maps.ovi.com/goodthings, maps.ovi.com/goodthings or text 62010, and entered data into the system controlling the giant signpost. During the first day the servers were flooded with people trying to get their Good Things on the signpost. Unfortunately Nokia was only able show a small portion of them. Updates on the campaign were posted on Twitter and as a Facebook event. Nokia held a nationwide vote where communities compete to win an exclusive gig with the X Factor winner Alexandra Burke. To ensure fair play, the town with the most votes in proportion to its population will win the exclusive Alexander Burke gig. Whether the town has a population of 50,000 or 250,000, some 500 towns will have an equal opportunity to win the vote. 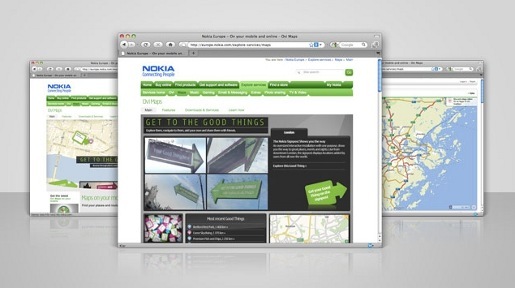 The Interactive campaign was developed at Farfar by creative director Erik Norin, copywriter Carl Fredrik Jannerfeldt, art director Tomas Jonsson, executive creative director Jon Dranger, head of strategy Niku Banaie, account directors Christian Nord, Marten Forslund, acccount managers Marie Persson, Ulrika Hojgard, Louise Stenborg, Flash developers Bjorn Uppeke, Mikael Ring, Robert Jarvi, creative president Matias Palm Jensen and programmer David Looberger. Word of mouth for the campaign was developed by 1000Heads.